Spending my afternoon off doing the usual things; as I was folding laundry watching one of my favorite quirky comedies, Bubba Ho-tep, it brought to mind an interesting bit of medical history.. the era of the Iron Lung, or negative pressure ventilator. There is a brief scene at the beginning of the film, which is set in “Shady Rest Home” in rural Texas.. In this scene at the beginning of the film, one of the nursing home residents, who is a bit of a thief, steals the glasses from another resident, an elderly woman who is imprisoned in an iron lung. Not everyone needed to use iron lungs for years – in fact, many of the children and young adults stricken with polio recovered after several months, and went on to live normal (ventilator-free) lives. But for others – the iron lung became a life-long condition. Here are some of their stories.. 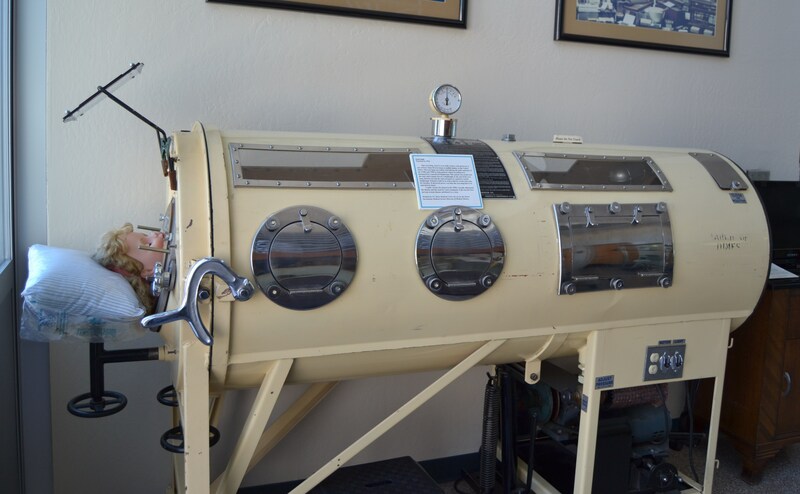 Soon, as these few elderly patients pass away – the iron lung, the relic of early life support technology will be forgotten into the pages of history; remembered only by history buffs such as myself, in a few scattered photos and the backrooms and storage sheds of obscure museum archives. The negative pressure ventilator aka ‘tank respirator’ worked exactly as it sounded – patients were placed into the small cylinder, with their chests and lower bodies enclosed as the machine applied negative pressure (think of vacuüm suction) to make the patient’s chest physically rise for inspiration. While iron lungs were invented in the late 1920’s, they became popularly known in the decades following their invention due to Poliomyelitis. The iron lungs became critical life-saving devices for large numbers of people, especially children (who were more affected) during the polio outbreaks of the forties and fifties, and were one of the most visible images of medical technology / modern medicine of the era. Martha Mason, one of the most well-known of the modern-day iron-lung reisdents published a memoir entitled, “Breath” of her sixty-year experience in 2003. It’s a great glimpse into a full and amazingly rich life lived despite these handicaps. Bangor man living with effects of Polio still in Iron Lung. “We are all welcome here” – fictionalized biography of Pat Raming. The Sessions: Life in an iron lung – movie about man in Iron Lung. Click here to read an interview with the actor. Mark O’Brien – the real life behind the man in the sessions. Interview with British man from 2004, BBC living in an iron lung. A practical mechanical respirator, 1929: the ‘iron’ lung. Meyer, J. (1990). Annals of thoracic surgery. Negative pressure ventilation in the treatment of acute respiratory failure: an old noninvasive technique reconsidered. – 1996 article on potential modern applications for the iron lung. Iron lung versus conventional mechanical ventilation in acute exacerbation of COPD. – a 2004 article comparing use of iron lung (negative pressure ventilation) with more invasive positive pressure mechanical ventilation. This entry was posted in Nursing and tagged are there modern uses for iron lung technology?, Iron Lung, iron lung ventilation (ILV), Martha Mason, mechanical ventilation, negative pressure ventilation, polio, the Sessions. Bookmark the permalink.